Carbondale resident and Glenwood Hot Springs Pool regular proves age is no reason to stop doing what you love. 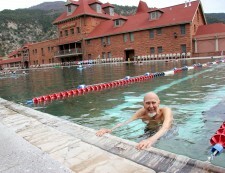 GLENWOOD SPRINGS, CO , April 14, 2017 (Newswire.com) – ​​​For more than 45 years since he moved to the Roaring Fork Valley, John D. Lawyer has been a regular at the Glenwood Hot Springs Pool, logging hundreds of miles in the pool’s lap lanes over the decades. These days, closing in on 100 years young, Lawyer doesn’t make it to the pool every day, but he still swims twice per week. “It’s only because he no longer drives that he doesn’t go every day,” said his daughter Illène Pevec. John brings up Tom Robinson frequently during the conversation, a man who clearly had a profound impact on his life. “My father’s love of swimming speaks to how having a wonderful mentor can shape a life and have an impact forever,” said Pevec. I like to swim laps, not sit around. Pevec explained that her parents started coming to the Aspen area in the 1950s. John and his family instantly fell in love with the area and made a point to visit twice a year, every year, once in the winter for the skiing and once in the summer for the concerts. Unable to resist the call of the mountains any longer, John officially transplanted the family to the Roaring Fork Valley in the 1970s. After the move, Lawyer worked as – you guessed it – an attorney. He later became Carbondale’s first municipal judge. As if that wasn’t enough to keep him busy, he taught classes in astronomy at Colorado Mountain College, another passion he picked up while living in close proximity to the university. 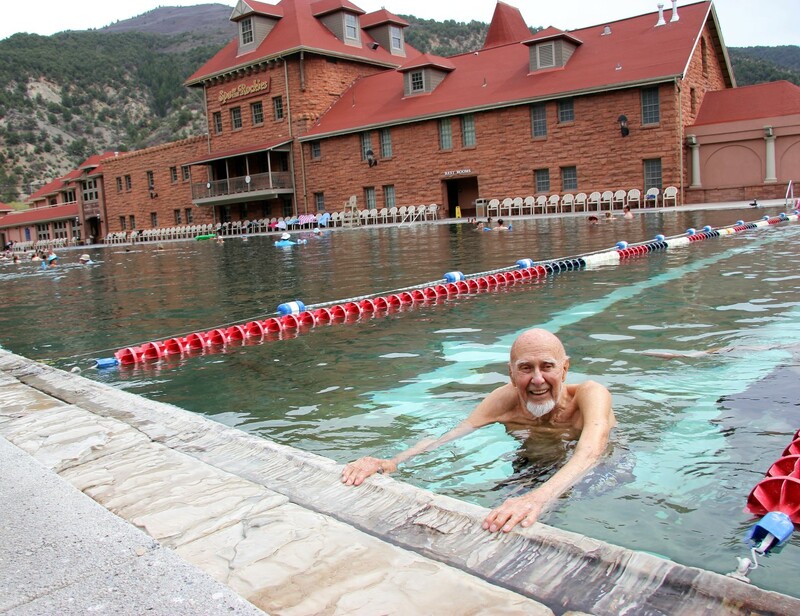 With the help of his family who transport him from Carbondale to Glenwood Springs, Lawyer is able to swim at the Hot Springs on regular basis. Since having a bout with shoulder bursitis, he prefers the sidestroke. When asked if he likes to soak in the Therapy Pool, he waves a hand and laughs, “I like to swim laps, not sit around.” A clue to his longevity perhaps? Even when he was recovering from knee replacement surgery in his 80s, Lawyer didn’t sit idly by. He consistently practiced his physical therapy exercises in the thermal waters, which according to his daughter helped him bounce back. Lawyer can’t speak highly enough of the lifeguards and staffers at Glenwood Hot Springs, “They all know me by name and I feel very safe, knowing they’re watching out for me. I get the feeling they keep a special eye on me, you know because of my age,” he joked. “It’s comforting to me that he feels looked after and welcome at the Pool,” added Pevec. As a thank you for being a loyal pool-goer and overall inspiration, Glenwood Hot Springs gave Lawyer an annual pool pass. “It was such an unexpected surprise,” said Pevec. As for some sage counsel, Lawyer’s advice is ageless, “Whatever your passion, you have to keep at it, stay motivated and never give up on anything you like doing.” Words of wisdom indeed. Glenwood Hot Springs is a historic Colorado landmark resort located along I-70 at Glenwood Springs, approximately 165 miles west of Denver and 90 miles east of Grand Junction.